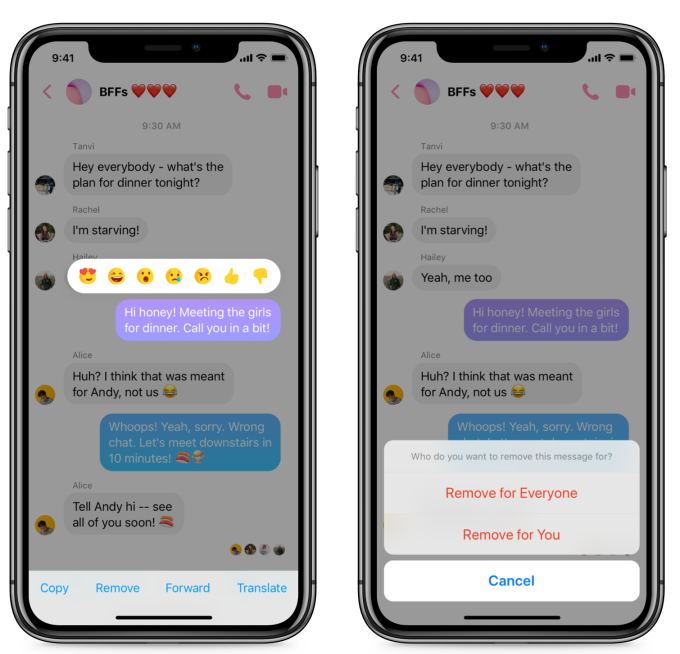 Just last month, Jane Manchung Wong, an app researcher, uncovered code for a Facebook Messenger unsend tool. Then, it was listed as “coming soon” in the release notes for version 191.0 for the iOS mobile app. Now, it’s actually going live on both iOS and Android. The feature is called “Remove for Everyone,” and it’s now working in Poland, Bolivia, Colombia, and Lithuania. Facebook states it plans to expand it to more countries as soon as possible. When it arrives, users can delete sent messages but must act to do so within ten minutes. Deleted messages don’t completely disappear, however. Though the messages themselves will go away, it’s place will remain in the form of a tombstone. Plus, there are two options: Remove for Everyone and Remove for You. The former deletes all parties, while the latter is self-explanatory.